M.Baituganov was born in 1921 in stanitsa* Tchernoyarskaya, North Ossetia. His military services began in 1940. A year later he graduated from military school and became an officer. As a commander of machine gunners he participated in many battles of WW2. In 1945 within the Zabaykalsky and Far Eastern Fronts he fought Japanese forces and contributed a great deal to the allies’ victory. 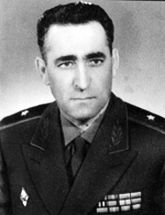 In 1960 colonel Baituganov graduated from the Frunze Military Academy and later on, in 1968 he became a major-general.